Victoria Eugenia Theater (Teatro Victoria Eugenia) Just steps away from San Sebastián’s old quarter sits the Victoria Eugenia Theater. There, the commanding Belle Époque-style building stands watch over Okendo Plaza, as well as the River Urumea, which flows out to the Bay of Biscay. Francisco de Urcola designed the early 20th-century property in response to the Basque city’s growth as a destination for Spanish and European aristocrats. Now, it’s considered one of the most beautiful buildings in San Sebastián and also as one of the most prestigious theaters in all of Spain. And upon seeing it, there’s really no surprise as to why. 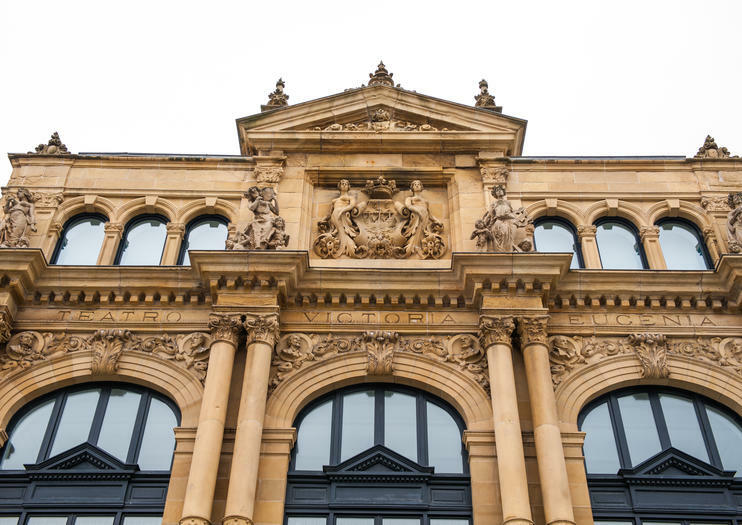 It boasts an attractive sandstone exterior, whose columned front façade is adorned by four prominent sculptures, each of which represents opera, tragedy, comedy and drama. Meanwhile, the interior dazzles with golden balconies filled with red velvet chairs, and a ceiling of frescoes illuminated by an elaborate chandelier. Apart from shows ranging from opera to dance and musicals, Victoria Eugenia Theater has also played host to the San Sebastian International Film Festival, as well as various movie premieres. Utforsk San Sebastian i ditt eget tempo med denne uavhengige 3-dagers tur som inkluderer to netter med overnatting, snacks, drinker, et bykart, kuponger og en innkvarteringsbillett til akvariet i byen. Du vil også motta et informasjonshefte, slik at du kan se toppattraksjoner du ikke vil gå glipp av under oppholdet.